The Balancing Rocks are geomorphological features of igneous rocks found in many parts of Zimbabwe, and are particularly noteworthy in Matopos National Park and near the township of Epworth to the southeast of Harare. The formations are of natural occurrence in a perfectly balanced state without other support. 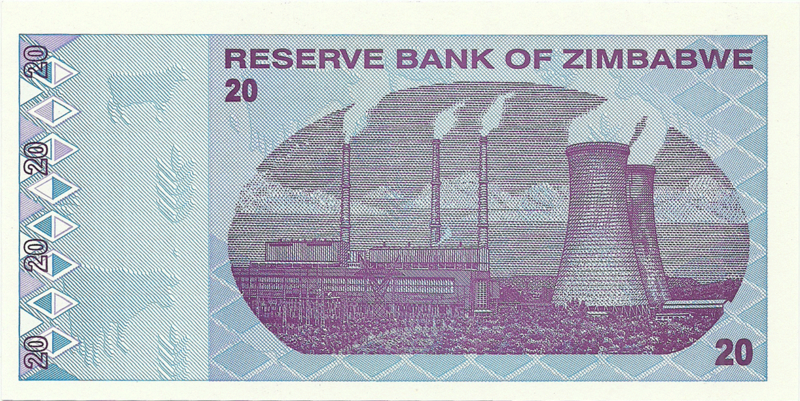 Their popularity grew when the Reserve Bank of Zimbabwe featured the formations on the last series of Zimbabwean banknotes. The Balancing Rocks have been used as a metaphorical theme to explain the importance of development coupled with preserving the fragile environment of Zimbabwe as similar to that of the Balancing Rocks found in Epworth, Matopos and in other areas. In lower right corner is a profile of the stone-carved Zimbabwe Bird. It is the national emblem of Zimbabwe, appearing on the national flags and coats of arms of both Zimbabwe and Rhodesia, as well as on banknotes and coins (first on Rhodesian pound and then Rhodesian dollar). It probably represents the Bateleur eagle or the African Fish Eagle. The original carved birds are from the ruined city of Great Zimbabwe, which was built by ancestors of the Shona, starting in the 11th century and continuing for over 300 years. The ruins, after which modern Zimbabwe was named, cover some 1,800 acres (7.3 km²) and are the largest ancient stone construction in Zimbabwe. Among its notable elements are the soapstone bird sculptures, about 16 inches tall and standing on columns more than a yard tall, were installed on walls and monoliths of the ancient city of Great Zimbabwe. They are believed to have been a sign of the royal presence. After the ruins of Great Zimbabwe were discovered by European colonists in the late nineteenth century, they took five of the carved birds to the Cape Colony and sold them to its leader Cecil Rhodes. A German missionary came to own the pedestal of one bird, which he sold to the Ethnological Museum in Berlin in 1907. At the independence of Zimbabwe in 1981, the South African government returned four of the statues to the country; the fifth is held at Groote Schuur, Rhodes' former home in Cape Town. In 2003, the German museum returned the portion of bird's pedestal to Zimbabwe. On background are stylized grains and livestock (cows, pigs). Denominations in numerals are repeated 5 times, in words lover. 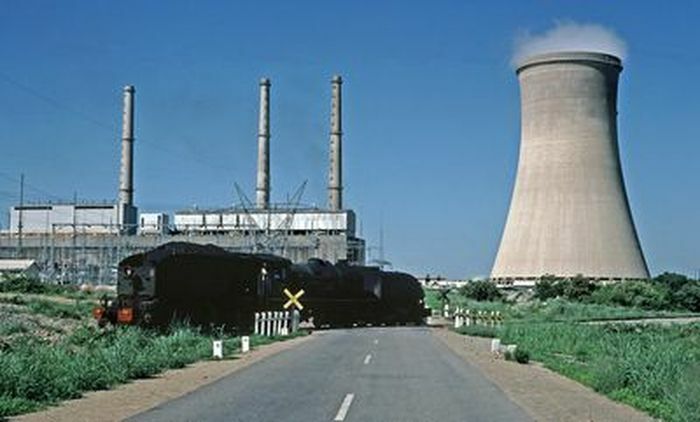 The Hwange Thermal Power Station is the biggest power plant in Zimbabwe with an installed capacity of 920 MW. It was built in two stages and consists of 4 units of 120 MW each and 2 units of 220MW each. Engineering Consultants "Merz & McLellan", were employed for the design and supervision of the construction of the power station. Construction of Stage 1 commenced in 1973, but was suspended in 1975 due to economic sanctions imposed on Rhodesia. Stage 1's units were commissioned from 1983 to 1986 with Stage 2's units following in 1986-1987. A reliable source of water lies further north, in the Zambezi River. From there, through a 44 kilometers long pipeline, water for the Boilers and Cooling Towers is drawn by both high and low lift pumps to a storage reservoir located adjacent to the station and conveyed by gravity to the station. About 107000 cubic meters of raw water can be provided per day; while the demineralisation plant has a capacity of 5420 cubic meters per day. A 3.5 kilometers conveyor belt brings about 1750 tonnes of coal per hour from the nearby Wankie colliery open cast mine, and 250000 tonnes of coal are stockpiled on site. Coal reserves estimated to support 1'200 MW for an estimated 30 years are concealed beneath the vast expanse of the coal mine. It is owned and driven by the national electricity company "ZESA Holdings (Pvt) LTD."
Technical problems due to neglect of maintenance, part replacement and upgrading make the plant prone to frequent production stops. In 2009, Namibia's "NamPower" made agreements to help "ZESA" to revive the plant’s capacity in exchange for power deliveries. The extensive problems are however continuing and have even led the government to considering a full close-down of the plant. On the background are stylized grains and livestock (cows). Denominations in numerals are repeated 6 times. 3 mm. iridescent stripe with repeating RBZ.